The body's #1 muscle energy fuel: CytoCarb II is the pure carbohydrate powder that does more than increase performance and recovery. It is also designed to promote anabolic status and muscle growth. More than yesterday's energy powders, CytoCarb II is today's single most powerful nutrition tool for customizing carbohydrate intake to meet specific goals. Enhance recovery: CytoCarb II is anti-catabolic. It helps stop muscle breakdown after workouts. Taking it within the "golden hour" after workouts super-recharges critical muscle glycogen, and kick-starts the body into favorable nitrogen retention. Promote hypertrophy: CytoCarb II is pro-anabolic. It helps facility the uptake of amino acids into hungry muscle, leading to muscle growth (hypertrophy). This volumizing and "force-feeding" of amino acids helps trigger the bottom line to muscle growth and repair-protein synthesis. Customized nutrition: CytoCarb enables you to customize shakes and juices to double, even triple, their carbohydrate content. Sometimes, you need more carbs to achieve your goals. CytoCarb II is the perfect tool to increase carb intake for harder workouts and faster recovery. All thriller, no fillers: Pure, 100% complex carbohydrates. With zero fat, ultra low sodium, no flavoring, colorings or additives, CytoCarb II is all thriller, with no filler. It's the purest, cleanest carbohydrate in the world. Easy to use: Dissolves instantly in water. No clumping like others, and no blender needed. 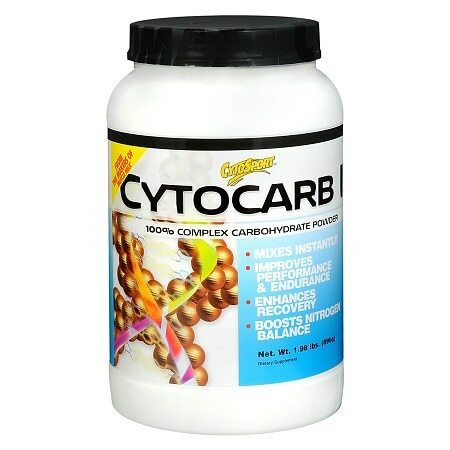 CytoCarb II is tasteless, so you get added carbohydrates without added sweetness. You won't know CytoCarb II is in your drink, but your muscles will next workout. Blend 4 scoops into 8-12 ounces of your favorite water, juice or milk.
. © 2009 CytoSport, Inc.